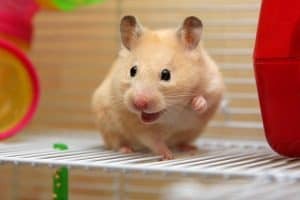 How to choose the best cage for a hamster? This is perhaps the most pressing and compelling question facing new hamster owners. Just as you would be highly selective about the residence that houses you and your family, you want to be equally choosy about the cage that offers shelter and comfort to your furry best friend. We’ve researched the question in depth and bring you some answers. Size – Make sure the cage has at least 288 square inches. More is better. Material – You can choose between a wire cage or an enclosed glass terrarium. Or you can make your own cage from a large plastic bin. Safety – With a wire cage, make sure the bars are spaced narrowly enough so your hamster can’t get out. Would you like some practical advice on how to choose the best possible home for your hamster pet? Read on now for some key tips and tricks on how to choose the best cage for your hamsters, for virtually all species of hamsters, including Syrian, dwarf/Roborovski and Siberian. Let’s take a closer look at everything you need to know about these three elements. What is the right size for a hamster’s cage? Space ranks among the chief considerations for conscientious hamster owners choosing the perfect home for their pet. Spacious cages tend to work best, with recommended sizes for most breeds measuring at least 24 inches wide by 12 inches deep by about 10 inches tall. In fact, many experienced hamster owners will tell you that this is too small for the larger Syrian hamster (the most common type of pet hamster). It should be enough as a minimum cage size for a single dwarf hamster though. If you can, please go bigger. The bigger, the better. Research shows that hamsters are less stressed when provided with a large cage. Hamsters who in any way feel cramped or confined may express their displeasure by clawing or nipping at cage bars—or at you, if you get too close to them at the wrong time. They also might squeal or whine their unhappiness, which can be at the least annoying and at the most distressing for the conscientious pet parent. Hamsters need plenty of room to run and play. And since you can’t often give them the run of the house, for safety and security reasons, you must provide them ample room to move. This way they can develop their bodies, maintain a healthy weight, and boost their overall fitness levels. On a related note, hamsters need a playground or play area in which to enjoy toys and games. Any spacious cage can morph quickly into a playpen; one in which they can store and play with their toys and play equipment. What size cage does a hamster need? Your next consideration is the material of which your hamster’s cage will be made. Let’s quickly review the various options. Most stores will try to sell you a regular wire cage. That’s an option, in principle, as long as the cage is large enough. The main issue with store-bought cages that are sold “for hamsters” is that they are way too small. And no, having several levels doesn’t make the cage larger. Hamsters need enough floor space as they’re not great climbers. What you can do is buy a large wire cage that’s marked “for rabbits” or “for guinea pigs”. These cages are usually spacious enough for a hamster. The problem with those larger wire cages is that the bars are often spaced too far apart. It’s fine for a larger animal, but a hamster can squeeze through the bars and escape. What you can do in this case is place plexiglass sheets against the bars to prevent your hamster from accessing them directly. It might surprise you to hear that hamsters can live in a glass tank. Also known as a terrarium, these are basically aquariums, with solid glass walls in all directions. Reptiles are often housed in glass tanks but they’re unsuitable for most small furry critters like bunnies, guinea pigs or rats. A glass tank just isn’t ventilated enough to deal with the ammonia from the urine produced by these small pets. Because hamsters are basically desert animals, they don’t produce so much urine. Which means less ammonia in the air and no risk to their delicate airways. Hamsters can, therefore, be safely placed in glass tanks. Glass tanks aren’t cheap but you can easily find very large ones that would make a wonderful home for your hamster. This is a great choice if you can afford it. Don’t forget to get a cover for your glass tank. The lid should be based on some form of a net, to keep the cage ventilated, yet be heavy enough so it will stay in place. The third material you can consider is plastic. Yes, a large plastic bing can be a wonderful cage for your hamster. It’s much cheaper than a terrarium, so you can invest in a very large one. On the other hand, it’s not see-through, so you won’t be able to enjoy watching your hammy all day long, as you would with a glass tank. That’s the main reason why most owners cut holes in the bins so they can see their hamsters through them. The hamsters don’t mind either way. You can read here about how to make a great DIY hamster cage from a large plastic bin. What is the Right Shape for a Hamster’s Cage? Modern hamster cages come in a variety of forms and shapes. While some resemble traditional animal cages that are squared in shape, others bear more novel and unique shapes. Your hamster wouldn’t mind the shape of the cage much. Most owners go for a rectangular cage as it’s the easiest to fit into a room – without giving up on cage space. Like the vast majority of animal cages, the cages that house hamsters tend to be square in shape. This shape is particularly accommodating for larger hamster homes, allowing them plenty of room to run around and play. Plus its four corners allow your pet plenty of places to stash away their foods and toys (as hamsters are naturally inclined to do), in addition to primo petting and napping spots. Just as hamsters enjoy the perfect roundness of the running wheel, many also enjoy rounded cages—at least to a certain extent. Indeed, few hamster cages take the strictly circular form of a bird cage; this owing to the fact that the hamster is a larger and more active creature that needs more room to roam. However, cages with rounded edges and ends are widely available on today’s animal supplies market and may resemble aquariums or chests in appearance. In point of fact, some hamster owners do choose to keep their precious pets in aquariums—sans the water, of course! Very large cases in particular can benefit from a generous rectangular shape. This elongated shape, in fact, can facilitate the ideal running course and play area for the ever active hamster. Some rectangular hamster cages are designed to look like small houses. A good number of hamster cages resemble actual homes, boasting home features such as lofts, dining areas, tubes and ladders (which can serve as convenient passageways from one part of the home to the others), playrooms, and as many as two to four levels or floors (not always a good thing, as you’ll soon see). And while some of these specialty cages simply boast an arched roof (which frequently opens on a hinge or can be popped off and removed at any time to facilitate easy access to the cage) and a boxed main body, other are true works of artistic novelty that liken dollhouses in appearance. Certain hamster cages could qualify easily as works of art, incorporating a number of exquisite shapes and themes into their remarkable designs. The two main safety considerations when choosing your hamster’s case are the spaces between bars and the number of levels. We’ve mentioned the former when discussing wire cages. If you buy a wire cage, make sure the bars aren’t placed too wide apart. Not only can your hamster escape through them, but some hamsters may also actually get stuck. The second issue is that of levels. Many cages offer more than one level. This seems smart. After all, why not make the most of vertical space? You only have so much room in your home to place a cage on the floor (or on a piece of furniture). The problem is with open designs where hamsters can topple over from the third or fourth level of their cage to the bottom. That may just be too high of a fall for their delicate body. Hamsters can and do become injured when falling inside a multi-level cage. If you want to offer your hamster multiple levels, the best way to do that is by connecting the levels with tubes. That way your hamster is safe while making the journey up and down. 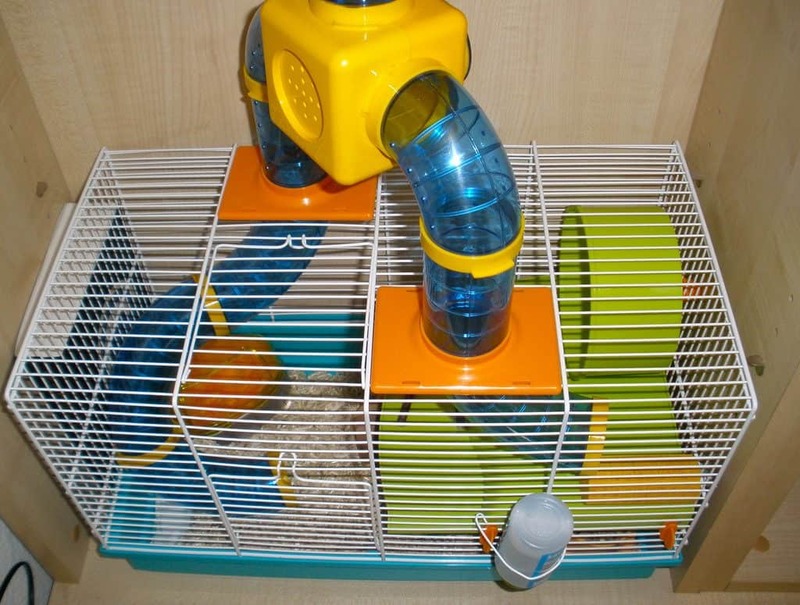 In fact, some owners connect several cages using tubes, to offer their hamster extra room and make use of available vertical space in their home. A great, reasonably priced square starter cage for the new hamster owner, My First Home Habitat sports multiple levels in its 24”X12” wire structure, along with a deep base, solid plastic shelves and ramps. This compact and colorful two-level hamster’s habitat is all-inclusive, in that it features a petting zone, an exercise wheel, a food dish, and a water bottle. And if all that isn’t enough, then it also includes a look-out tower, an exterior extreme wheel, generous bar spacing, and a handy front access door. This basic and compact ebony hamster cage is a 23.6 X 14.4 inch, two-floor structure consisting of a wire net upper part and a transparent plastic base. It comes complete with a multitude of accessories, like a nest, a food bowl, an exercise wheel, a ladder connecting the floors, and a drinking bottle with a steel nozzle. Even larger cages are available at dimensions of 46-8/9-inch length by 22-4/5-inch width by 24-inch height and beyond. This generously spaced habitat comes complete with an upper wire frame, a plastic bottom base, a food dish, sound ventilation, and—yes—even a balcony with an access ramp. Even a hammy needs a balcony, once in a while. This lavish palace of a hamster cage is a sprawling and colorful oversized structure featuring a wheel house, tubes, platforms, multiple levels, a concealing house within a house, access doors and generous ventilation. Resembling a professional level farm fixture, this spacious (38.2 X 33.8”) cedar habitat is lined with solid iron wire and boasts charming hues of ivory, grey, and ruby red. The hutch’s latches are secure and its tray can be pulled out. This hutch can house several hammies. Why Do Hamsters Need Cages? Now that we’ve talked about how to choose the perfect cage for your new hamster, a few words about why you even need one. The vast majority of domesticated pets don’t need cages. Can you imagine even trying to cage Fido or Fifi, your ever pampered lap dog or cat? Hamsters, by contrast, are generally in need of their own wire-enclosed homes; and for a variety of reasons. Hamsters, if you haven’t noticed, are mighty small creatures. Their size, in fact, might render them potential prey for larger house pets, who may wish to hunt and eat them; and for small children in the home, who may chase them or pull at their fur. Even well-meaning adults might accidentally step on or trip over their hammies. This is why they need a safe house, in the form of their cage. Why do you need a home? Is it because you require a stable and reliable place to sleep, eat, work and play? Well as it turns out, your hamster also needs a place to crash—and to live. Far from a prison, a cage is the animalistic equivalent to a residence. A territory your hamster can call his or her own. Having said that…. You have to keep your hamster supervised when out of the cage for his or her own safety – but also for that of your home. Left unsupervised, a hamster can easily start munching away on curtains, furniture or anything else he can chew on. Since you can’t supervise your hamster all day long, that’s another reason to keep him or her in the cage. What is the Price Range for Hamster Cages? The price range in regards to the hamster cage varies widely from model to model. It is virtually impossible to designate a single price point for this type of cage. Visit any pet supplies store, be it brick and mortar or online, and you will find cages that range in cost from $5 to $150. If one were pressed to identify an average price range for hamster cages, it probably would fall between $25-80. It almost goes without saying that larger hamster cages will cost more; ah, but we’ll say it anyway. A 46 1/2″ x 24″ x 36 1/4″ model might cost $150, whereas a 12.4 x 9.45 x 7.87 inches (not a recommended size) might be purchased for under $20. Yet even this will also come to depend on…. Some, very expensive hamster cages will be fashioned from fine polished, hand carved fir and other woods. 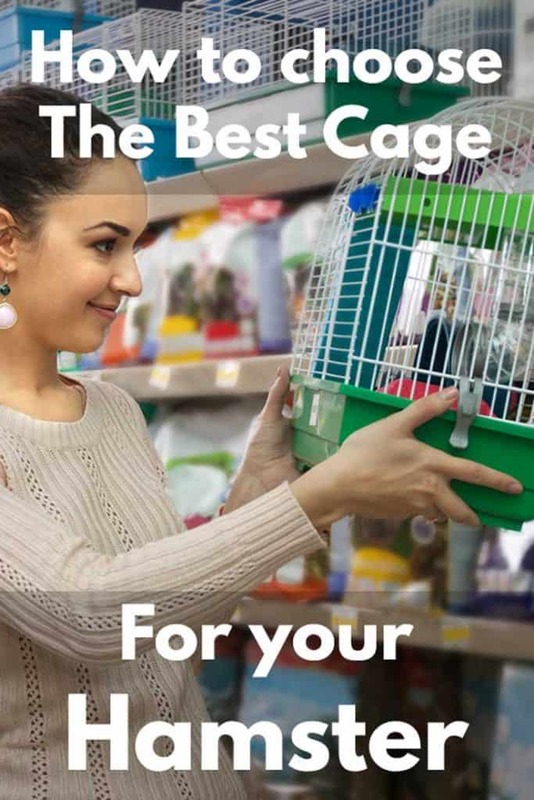 Many, more moderately priced models might be made of wire or plastic; but here again, one can find more or less expensive cages formed from these same materials. And that all depends on size and…. Much like a human home, a hammy hut with extras is bound to cost more than a cage that boasts the basics. What are some “must haves” for a hamster’s cage? When it comes to the concept of the hamster cage, some devoted hammy owners support the concept of ‘go big or go home.’ They wish to invest in a first class ‘hamansion’ (yes, we just came up with that oh so clever name and plan to trademark it sometime soon, so don’t get any ideas…😊) or a hamster habitat. Here’s a super quick recap here too. The entire point of a cage, after all, is to supply your pet with a safe and restful refuge; a place where they can retreat in comfort to relax and sleep. To this end, bedding (or a bedding tray that you can fill yourself) should either come as a part of or be placed within a hamster’s cage. No need for quilts or canopied four posters here; quality bedding at least six inches deep will suffice, providing that they are kept clean and fresh at all times. A hamster always must have access to clean, clear water; and most cages come complete with built-in water bottles that range in size from four to eight ounces. If yours doesn’t, invest in one. A water dish is an option as well, but make sure it’s not too deep so that your hamster doesn’t fall in and get wet. A hammy cannot live on love alone, so any basic hamster cage should come complete with a deep and spacious (not to mention preferably ceramic) food dish. More than a toy, the hamster wheel is a necessary and multi-functional component of any hammy home. The spinning hamster wheel helps them get their needed daily exercise, release their stress, and play to their hammy heart’s content. This wheel will generally be made of wood or plastic, and is the toy most frequently built in to the structure of hamster cages. When examining the typical hamster cage, you are bound to see a small house within a house that resembles a dollhouse, igloo or square container. This is not a toy, but an essential hiding place that forms a vital component to any hamster house or habitat. Especially when he/she is young and/or newly purchased, the hamster will need privacy and security in their cage. A place to relax, to destress, and to escape other animals or even humans if they make them nervous. Most hammy hideouts will take the form of small plastic structures, although in truth ceramic or wooden hideouts are far preferable. This owing to the fact that hamsters sometimes gnaw the edges of their hideouts, and a plastic diet could be detrimental to their overall state of health. 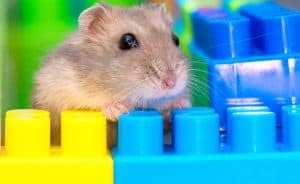 Your hamster should have easy access to those wheels, strings, ladders, chew toys, and other assorted playthings that help to ensure their peace and happiness. The upper-end hamster cages will come complete with a small but very helpful storehouse of large and small playthings. And all hamster cages should boast sufficient storage space for you, the devoted hammy owner, to fill with way cool hammy toys. Need to know even more? On a general basis, animals are not known for their great love of being caged. Yet if you give your beloved hamster a cage that serves as a priceless combination of a cozy home, a trusted safehouse, an ultra-fun playhouse, and a relaxing retreat, then he/she might not mind ‘taking their toys and going home’ in the wake of a play or exercise session. What size should a hamster’s cage be? Don’t forget to share this article with friends and to leave us a comment describing which kind of cage you chose for your hamster and why. Previous PostWhat Toys Should I Get My Hamster?